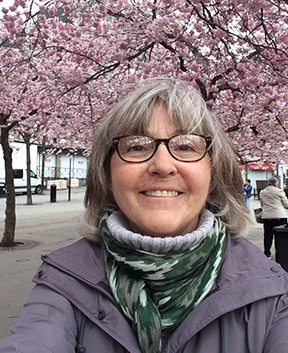 Bonnie’s Bio: Bonnie West’s stories and essays have appeared in numerous publications, including The Minetta Review, The Talking Stick, Woman’s Day, Redbook Magazine, The Austin Chronicle, and the anthologies, Still Going Strong and The Ultimate Dog Lover. She has four mini-mysteries for children published by Carol Rhoda Press and a bilingual Japanese/English book, Hideki and Kenji Save the Day, published in collaboration with Diane Carter. She lives with her husband in Saint Paul, Minnesota. If you haven’t done so already, check out Bonnie’s award-winning story “One Side of the Vase” and then return here for a chat with the author. WOW: Congratulations on placing in the Summer 2018 Flash Fiction Contest! What excited you most about writing this story? Bonnie: This story was written for a writing class in which we were to take our storyline from one of several suggested methods, a postcard or photo, a conversation we'd overheard or something we'd read in a magazine or newspaper. The next day I read an article, only a few lines, about an operation wherein the incorrect kidney had been removed and knew I had a story. The newspaper did not say who it was or which hospital was involved or how on earth it happened. But I became obsessed. I had no idea the real situation of the story but I knew in my story the doctor had to be a man. (What woman makes such a mistake?!) I also wanted it to feed into the doctor/father/god syndrome so her reaction (had to be a young woman patient) would seem realistic. And as for his childhood story I'd had that scene in my head for years and years and was delighted to find a home for it. WOW: What a good combination of ideas to create this story! Did you learn anything about yourself or your writing while crafting this piece? Bonnie: I learned, and was surprised to find with this story, once I began I wouldn’t stop until I had finished it. Usually I get going after a long drought and write for hours and hours but eventually I come to a stand-still and put the story away for months or years because I’m stuck, most often by the plot line or lack thereof. So in this case, having essentially been given a plot I was able to work on revising the story which happily is my favorite aspect of writing. With every rewrite I would think, No need for this! No need for that! So the short, short form is ideal. I absolutely loved trying to figure out what this doctor could possibly say to his patient and if and how he would possibly be redeemed. WOW: Sounds like a positive process for you this time, almost like a game. We’re glad you persisted with your revisions! In your bio you mentioned that you wrote a bilingual English/Japanese book Hideki and Kenji Save the Day. Could you tell us more about your collaboration on that project? WOW: I love hearing the stories behind the story! Thank you for sharing that with us. What are you reading right now, and why did you choose to read it? Bonnie: Right now I am re-reading Robin Black’s wonderful collection of short stories If I Loved You I Would Tell You This and trying to figure out how she does it! WOW: Great! I hope you learn something new and useful. If you could give your younger self one piece of writing advice, what would it be and why? WOW: I could benefit from that advice lately, too! Anything else you’d like to add? Bonnie: Absolutely. I want to thank you for these questions and WOW for this opportunity. WOW: You are very welcome! Thank you again for sharing your stories and for your other thoughtful responses! Congratulations again, and happy writing!